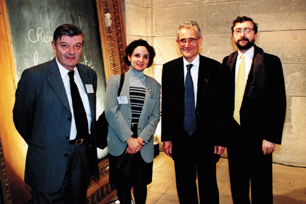 A two days event has been organized in honor of Professor Alain Bensoussan, on the occasion of his 60th anniversary in Paris on 4 and 5 December 2000: a conference on 'Optimal Control and Partial Differential Equations' and panels on Innovations and Applications of Space and New Technology. The first day of the conference was dedicated to fundamental research: Invited lectures were delivered by international wellknown scientists: Professors Jens Frehse, Hitashi Ishii, Jacques-Louis Lions, Sanjoy Mitter, Umberto Mosco, Bernt Øksendal, George Papanicolaou and Albert Shiryaev. The second day has been devoted to the tight links between research and applications and the impact of research on the real world especially through valorization of research results. This theme has been enlighted through round tables on the following topics: space, spatial applications, science and technology for information and communication. A last panel discussed the role of Europe as a priviledged example of the collaboration between research and industry. Left to right: Edmundo Rofman, Agnès Sulem, Alain Bensoussan and José Luis Menaldi. Moreover, a special volume, entitled Optimal Control and Partial Differential Equations edited by José Luis Menaldi, Edmundo Rofman and Agnès Sulem has been published by IOS Press on this occasion. It includes the proceedings of the lectures given on December 4th together with articles written in honor of Alain Bensoussan by his colleagues, collaborators and former students. Their topics include domains where Alain Bensoussan has offered leading contributions such as functional and numerical analysis, stochastic partial differential equations, nonlinear filtering and identification, dynamic programming and stochastic control, mathematical finance and operations management.